So I was chatting with A.R. and she asked me about my Silver Duckwings. As she said, referencing one of the pictures "what the heck is the blue one?" And it was like CLICK, holy moley, what ARE those blue ones? I've noted all along how amazingly similar they are to the Blue Brassy Backs, but never did I stop and realize they are NOT Silver Duckwings, but perhaps Blue Silver Duckwings!?!? How did I not make that connection? I think I just got so caught up in them being NOT Birchen that I didn't even realize it! Sometimes I feel really stupid. And for that matter how the heck did they end up blue anyway!?!? Silver Duckwing X Black = ??? According to Clinton Anderson, a horse is only being ridden if the rider's knees are not together. :-) So I've spent a lot of time "not riding" Shylah (lay across her back, stand up in stirrups, etc.). She's so good, she's so accepting. I couldn't resist, so this evening, by that definition, I rode!!!!!!!!!!!!!!!!!!!!! (yes that's very exciting!!) I stood up in the stirrup, she just stood there (like always), so I took a deep breath, swung over, and sat down. That's the first time I've sat on her (one knee on each side!) where I have NOT had a hold of the fence at the same time! ;-) And... she just stood there. I flexed her neck around a couple times, got off, got back on, flexed her again, got off, and ended the lesson there (and took her out in the field next door for some grazing!). So I didn't make her go anywhere, but hey, that's a start! I was the only one around and I figured I'd better not do anything TOO stupid. I'll end with a cute pic. I'm hatching mallards for a friend. 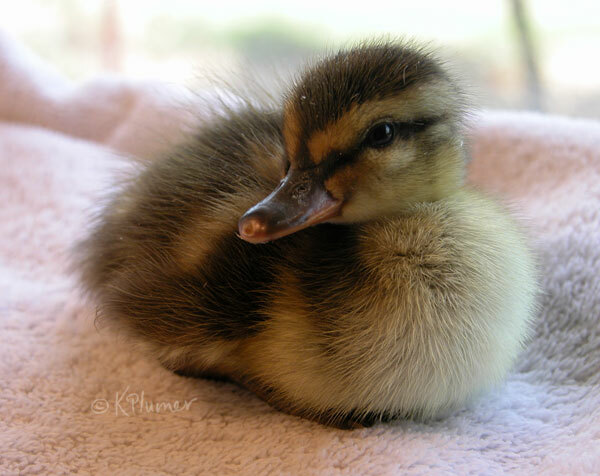 Ducks drive me crazy when they are older but right now they are just soooooooo cute! This is the best age to have them, I'll be happy to get rid of them in a couple days!